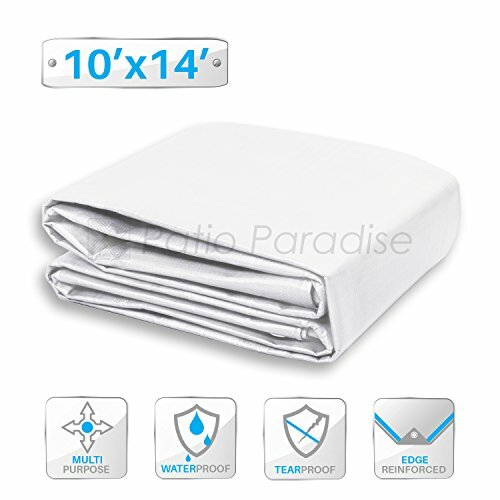 Patio Paradise 10 x 14 Feet White Poly Tarp, 10-mil Thick Lightweight Multi Purpose Waterproof Tarpaulin for Camping Trailer Canopy by Patio Paradise at Outlet Shopping Guru. Hurry! Limited time offer. Offer valid only while supplies last. Description Size Color Blue Attention: This Is Our Tarp Is Especially Treated with UV And Sunlight Resistant Formula for Extended Outdoor Use. Attention: This Is Our Tarp Is Especially Treated with UV And Sunlight Resistant Formula for Extended Outdoor Use. It Is for Maximum Strength and Durability with Reversible Colors (Silver & Blue) It Is Constructed Thicker Layers of Polyethylene for Longer Product Life. Regular specification, light-weight, 5 mil general multiple purpose tarpaulins are ideal for: construction sites, roofing, painting, leaf/debris cleanup, camping, picnicking, hunting, canopy and tent fly. They are appropriate covers for equipment, boat, outdoor furniture, wood piles, ,replace tents canopy cover It can be used for picnics, parties, storage covering，it is good for weathering, yard work, storage and camping. The blue tarp is washable and features rustproof aluminum grommets. Resist UV damage, water, tear and mildew.or almost anything that needs protection for the weather elements.Easy to carry (Light weight), easy to fold and store. View More In Canopies, Gazebos & Pergolas. If you have any questions about this product by Patio Paradise, contact us by completing and submitting the form below. If you are looking for a specif part number, please include it with your message.